Laser tattoo removal is a permanent solution for removing all or a portion of unwanted tattoos. What is Trinity laser tattoo removal? Laser tattoo removal is a permanent solution for removing all or a portion of unwanted tattoos. At RTH, we use the most versatile and powerful tattoo removal system, the Trinity® laser by Astanza®. The Trinity laser targets tattoo ink particles in the skin, shattering them and allowing the ink to be naturally flushed out of the body. Unlike other tattoo removal systems, the Trinity laser can treat even the most resistant ink colors and completely remove them without any scarring. Laser tattoo removal is the most safe, effective and non-invasive way to remove tattoo ink. A thorough consultation is an important first step when deciding if laser tattoo removal is the right option for you. We thoroughly discuss your desired results and provide an honest, professional opinion on how best to achieve those results. We also make certain that you are a good candidate for treatment, taking into account your skin type, age, health, medical background and other factors that could affect the safety and effectiveness of your treatment. All of our consultations are conducted with the goal of making sure that our patients feel comfortable, confident and informed about laser tattoo removal. The day of your treatment, wear comfortable clothing that allows access to the treatment area. Loose-fitting clothing is best, as you may experience some soreness around the treatment area. We offer a variety of skin numbing options including lidocaine injections, topical creams and the unique Zimmer Cyro skin cooling technology, which allows us to numb the area before, during and after treatment. The Trinity tattoo removal laser works by selectively heating and instantly shattering tattoo ink particles upon contact. Using different wavelengths of laser light, we customize your treatment to be most effective at removing the specific colors in your tattoo. The Trinity laser is the fastest and most powerful tattoo removal laser, giving you optimal results in a minimal amount of time. Virtually all tattoos require multiple treatments to be fully removed, and the removal process can take several months depending on the speed at which your immune system flushes away the shattered ink particles. Treatments are scheduled every six to eight weeks to allow time for your body to flush away the ink and for your skin to heal. Most appointments take only 15 minutes, and the treatment itself takes only a few minutes depending on the size of the treatment area. Patients often experience temporary redness, bruising, blistering and scabbing. The side effects are an important part of the immune process and an indication that an effective treatment was performed. Some patients may experience temporary pigmentation changes in the treatment area, and these changes correct themselves over time. If proper aftercare instructions are followed, scarring is not a common side effect and should not be expected. We will throughly discuss aftercare instructions with you to help you achieve the best and most natural results. After the necessary series of treatments are complete, a tattoo will lighten to the point where it can no longer be seen. During your consultation, we will thoroughly explain what results to expect. Q: Is laser tattoo right for me? If you are one of the millions of Americans with tattoo regret, laser tattoo removal may be the right option for you. Trinity laser tattoo removal is safe and effective on all skin types. Q: Why choose RTH Plastic Surgery for my Trinity laser tattoo removal treatment? When choosing a cosmetic professional for laser tattoo removal, there are three important qualifications to consider: training, experience and personal attention. Dr. Hajjar is Board Certified by the American Osteopathic Board of Surgery in plastic and reconstructive surgery. Above all, your cosmetic professional should be someone you trust to deliver exceptional results and perform a safe and effective treatment. At RTH, our cosmetic technicians are Trinity laser tattoo removal specialists and have been trained by the New Look Laser College specifically in the areas of laser tattoo removal procedures and patient experience. We spend the necessary time with every patient to answer any questions and address any concerns. We make it a priority to ensure our patients are well-informed and completely comfortable with their decisions. We know that your time is valuable, which is why we maintain an efficient treatment calendar and use the latest techniques and technology to maximize your results. Q: Will my insurance cover tattoo removal treatments? Insurance companies commonly do not cover an elective or cosmetic treatment like tattoo removal unless it is performed to correct a medical or health condition. If you plan to use insurance as payment, we strongly suggest consulting with your provider to discuss if the treatment is covered in part or in full by your current plan. Q: Will my tattoo removal treatment results look natural? Laser tattoo removal treatments are minimally-invasive, providing results without the need for any surgical procedures, thus greatly eliminating the possibility of scarring or other signs that a treatment was performed. During your consultation, we will thoroughly explain what results to expect. Once the necessary series of treatments is complete, tattoo removal results are permanent. Q: Can I have additional treatments in combination with my laser tattoo removal treatment to enhance results? 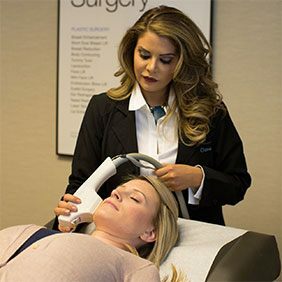 Yes, your RTH doctor can recommend additional services that may enhance your desired results including laser skin resurfacing and scar removal treatments.